Harper's Uniform Trade Edition issued in blue cloth with gold monogram on spine and cover donated to the Mark Twain Memorial Library in Hartford, Connecticut in 1929 features printing code F-B (June 1927) on the copyright page. Harper's Uniform Trade Edition issued in blue cloth binding with gold stamping on the spine and cover was the final effort by the Harper and Brothers publishing company to sell Mark Twain's works in uniform bindings. The history of this edition is also the most difficult to document. Given the absence of Harper's business records as well as evidence of an advertising campaign for the volumes, forensic evidence from the books themselves provides the best clues to the history of this edition. Further complicating the search is the fact that the words "uniform trade edition" were often used to describe other books bound uniformly such as Albert Bigelow Paine's multiple volumes of Mark Twain's Biography and Paine's edited volumes of Mark Twain's Letters. None of Mark Twain's works bound in blue cloth with gold stamping feature any designation of Uniform Trade Edition on their title pages. The identification of Uniform Trade Edition for this blue cloth edition is found only on the dust jackets of later volumes and few such dust jackets have survived. Dating the volumes is a challenge due to the fact that in 1937 Harper and Brothers began recycling the alphabetical letters used to identify printing plates. Evidence indicates publication of these blue cloth volumes spanned several decades making it impossible to correctly identify the correct year of printing without additional forensic information. (For example, a book with a printing code of F-B might indicate June 1927 or June 1952.). First letter is month: A= January, B=February, C=March, D=April, E=May, F=June, G=July, H=August, I=September; The list skips J. K=October, L=November, M=December. 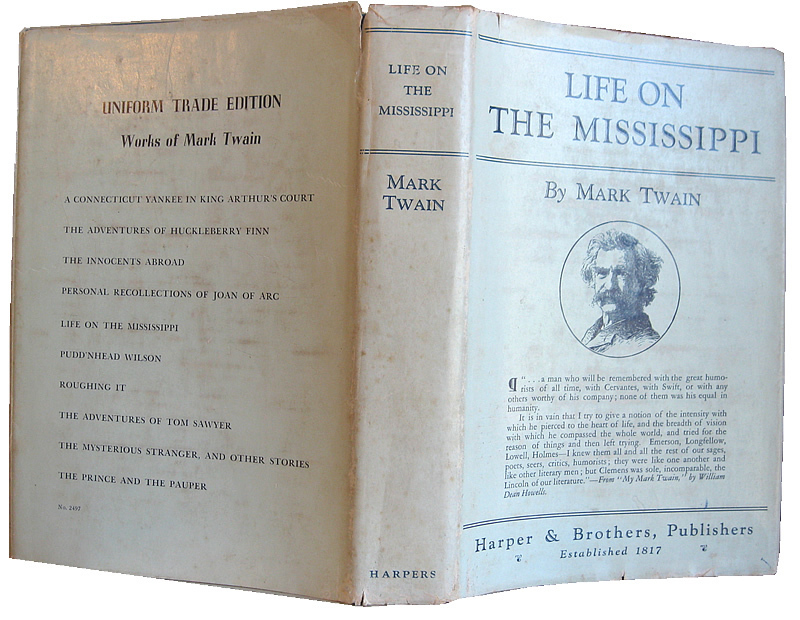 The Uniform Trade Edition's blue cloth binding with gold stamping was modeled after Harper's Mississippi Edition which was issued between 1923 and 1929. 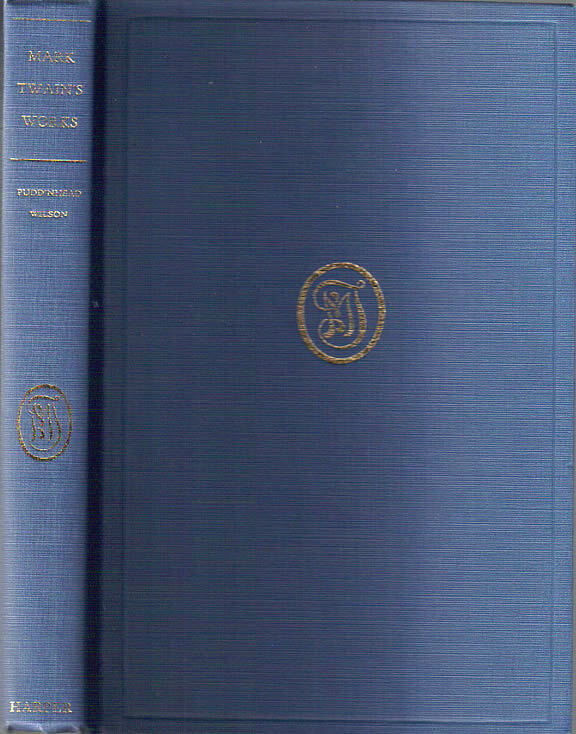 The Mississippi Edition was sold as a set in green cloth binding featuring the identical monogram used on the blue cloth Uniform Trade Edition. The year 1923 was also the year that Harper added the final title of one of Mark Twain's works to the old uniform edition featuring red cloth with gold cornstalk bindings. Comparing the blue cloth Uniform Trade Edition to both the Mississippi Edition and the red cloth with gold cornstalk edition reveals the illustrations found in the blue cloth Uniform Trade Edition volumes match illustrations found in Harper's red cloth edition but not those of the Mississippi edition. One conclusion that can be reached is that Harper was slowly abandoning the red cloth bindings in favor of what would become the blue cloth Uniform Trade Edition. An examination of the earliest surviving dust jacket found on a blue cloth edition indicates the text on the back of the jacket is identical to text on the dust jackets issued on the previous red cloth with gold cornstalks uniform edition. 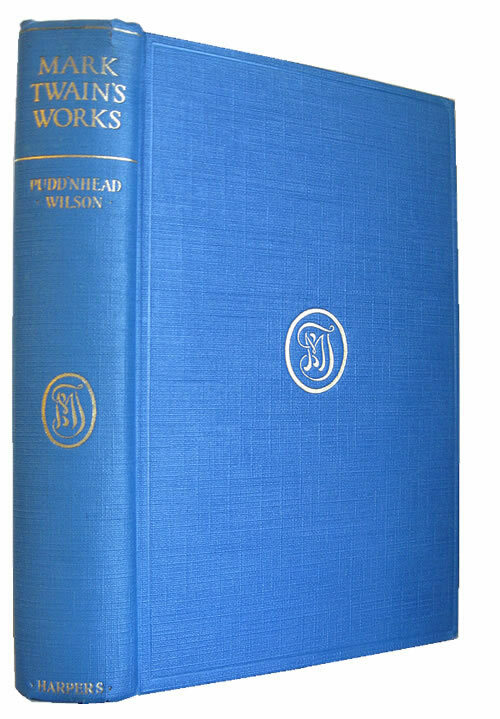 Printed in dark blue ink on light blue paper, this dust jacket wrapper covered a copy of Pudd'nhead Wilson donated to the Mark Twain Memorial Library in Hartford, Connecticut in 1929. The dust jacket pictured above which advertises a "Uniform Cloth Edition" was actually the same ad used on the dust jackets for the titles previously marketed in the red cloth with gold cornstalk bindings. One surviving dust jacket from a 1938 edition of Captain Stormfield's Visit to Heaven features an ad stating that the blue cloth series featured 23 titles. Ad from a 1938 edition of Captain Stormfield's Visit to Heaven courtesy of Kent Rasmussen. 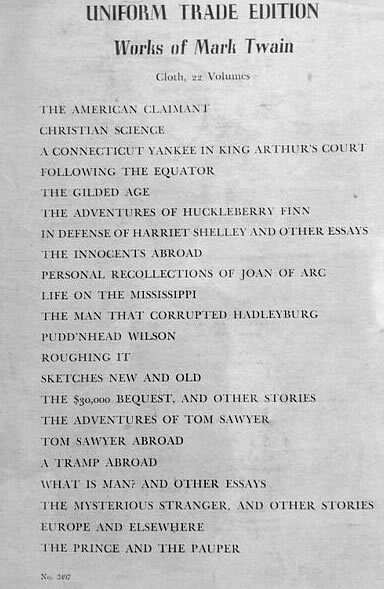 Subsequent titles in the blue cloth binding feature dust jacket ads listing only 22 titles. Missing from this ad below is Mark Twain's Speeches which had appeared in ads on jackets in 1933 but was apparently dropped from the series. Dust jacket ad from 1946 edition of The Mysterious Stranger states the series consists of 22 volumes. Missing from this list is Mark Twain's Speeches. Courtesy of Kent Rasmussen. Later editions of the blue cloth volumes featured dust jackets advertising a decreasing number of titles available in the series. 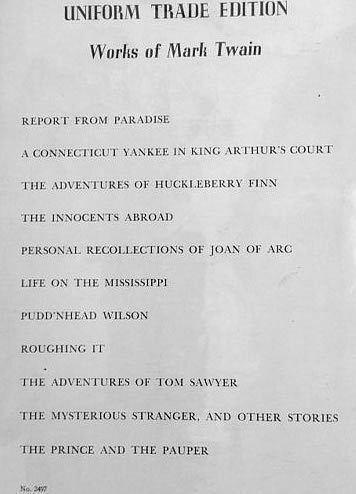 Dust jacket from 1957 edition of A Connecticut Yankee in King Arthur's Court advertising 11 titles indicates Report from Paradise had been added to the series. Courtesy of Kent Rasmussen. Dust jacket wrapper from a volume of Life on the Mississippi with 1951 on the copyright page and printing code D-I (April 1959). Only 10 titles are listed in the Uniform Trade Edition. Sales of the Harper's blue cloth Uniform Trade Edition likely continued well in the the 1960s. Prices found on the dust jackets for the volumes range from $3.50 to $4.50. Some book collectors speculate that Harper and Brothers printed a year code on dust jackets, independent of the year codes used for the printing plates that are found on the copyright page. If this theory is correct, some of the codes indicate the volumes were still being issued as late as 1964. While bindings of the volumes appear uniform over a number of years, later volumes feature a reduced font size on the spines. Uniform Trade Edition of Pudd'nhead Wilson with printing code of D-L (likely April 1961) features a font size on the spine that measures less than 1/8" for the title. On April 30, 1962 Harper and Brothers merged with Row, Peterson and Company of Evanston, Illinois to form Harper and Row, Publishers, Incorporated. No new uniform editions of Mark Twain's works were issued under the Harper and Row imprint. 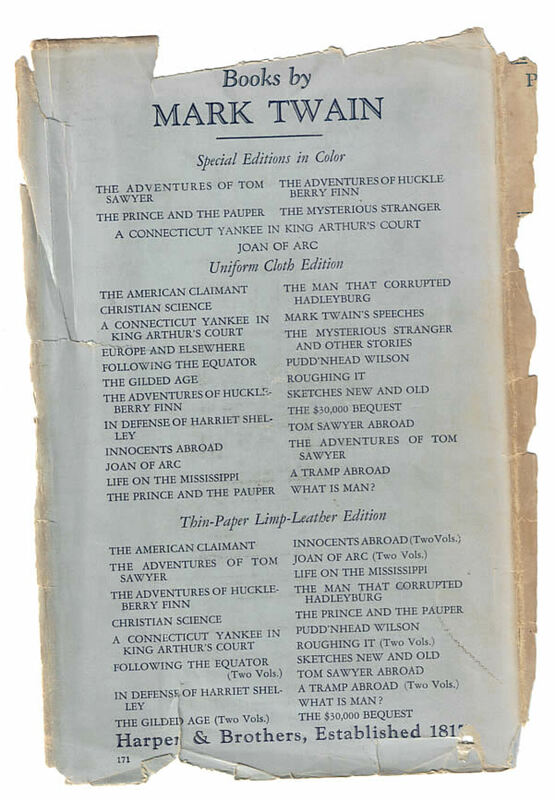 In 1962, at the time of the Harper merger with Row, the company had not issued a complete set of uniform volumes of Mark Twain's work in over 30 years. It had been 3 decades since the Stormfield edition, complete with Albert Bigelow Paine's multi-volume Biography, and his edited volumes of Mark Twain's Autobiography as well as two volumes of Letters had been offered to book buyers. While the American Artists Edition and Authorized Edition had been sold via newspapers throughout the 1930s, these volumes were not sold as complete sets and their sales depended on continuity marketing through select newspapers. By the 1960s, works such as A Tramp Abroad, Following the Equator, Christian Science, and collections of shorter works such as Sketches, New and Old became less familiar to new generations of Mark Twain's readers. Scholars such as Edward Wagenknecht who published literary criticism well into the 1970s were declaring the Gabriel Wells Definitive Edition or the Stormfield editions as the most desirable for use in scholarly studies. However, neither the Gabriel Wells Definitive Edition or the Stormfield edition are considered "authoritative" because they were not published in Mark Twain's lifetime and any changes in text was considered accidental. In spite of this fact, these sets contained works that had not been published in Mark Twain's lifetime and were a boon to scholars who could obtain access to them. However, both of these sets were limited to only 1,024 in numbers. Few public libraries owned them. Access to the lesser known works was become increasingly more difficult to obtain and more expensive. Exman, Eugene. The House of Harper, (Harper and Row, 1967). "First Edition Identification by Publisher," Quill & Brush / Book Collecting Tips. Accessed 15 March 2012. Philippon, Patti. Personal correspondence. 12 March 2012. Wagenknecht, Edward. Mark Twain: The Man and His Work. (University of Oklahoma Press, 1971).